This has got to be one of the best desserts around: a cheesecake and a brownie rolled into one delectable treat. And it's very easy to make! 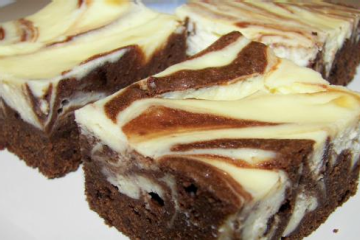 Here is an easy dessert recipe for Marbled Cheesecake Brownies. 1. Preheat the oven to 350°F. Grease an 8-inch square baking pan. 2. Make the cheesecake mixture: In a medium bowl using an electric mixer on medium-high speed, beat the cream cheese and sugar until smooth and fluffy. Best in the egg and vanilla until blended, scraping down the side of the bowl as necessary. 3. Make the brownie mixture: Melt the butter and chocolate in a small saucepan over low heat, stirring until completely melted and smooth. OR, microwave the butter and chocolate in a microwave-safe bowl, on High power for 1 minute. Stir the chocolate and repeat as necessary at 20 second intervals on High, stirring until the chocolate is melted and smooth. Let the chocolate cool slightly. 4. In a medium bowl using an electric mixer on medium-high speed, beat the eggs until frothy. Beat in the sugar and vanilla until well blended. Beat in the cooled chocolate until blended. Reduce the mixer speed to medium and beat the flour and salt just until blended. 6. Bake the brownies about 45 minutes, or until the top looks dry, but a pick inserted into center comes out with a few moist crumbs clinging to it. Set the pan on a wire rack to cool completely. When cool, cut into squares. I’m totally gonna try this!